Aonghas MacNeacail is best known as a Gaelic poet, but he also writes in English and occasionally in Scots. Born and brought up on the Isle of Skye, he attended Uig Primary School, Portree High School, and the University of Glasgow. Besides drawing on his rich Gaelic traditions, his work has also been influenced by poets of the American Black Mountain School, as well as Japanese and East European poetries. 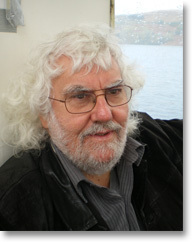 His collections, mostly in Gaelic with parallel English translations, include: An Seachnadh/The Avoiding (1986); Oideachadh Ceart/A Proper Schooling (1996), which won the 1997 Stakis Prize for Scottish Writer of the Year; and his most recent collection, Laoidh an Donais Oig/Hymn to a Young Demon (2007). He also writes song lyrics and libretti and has collaborated with a number of musicians and visual artists. His work has been widely translated and he reads his own work at festivals around the world.